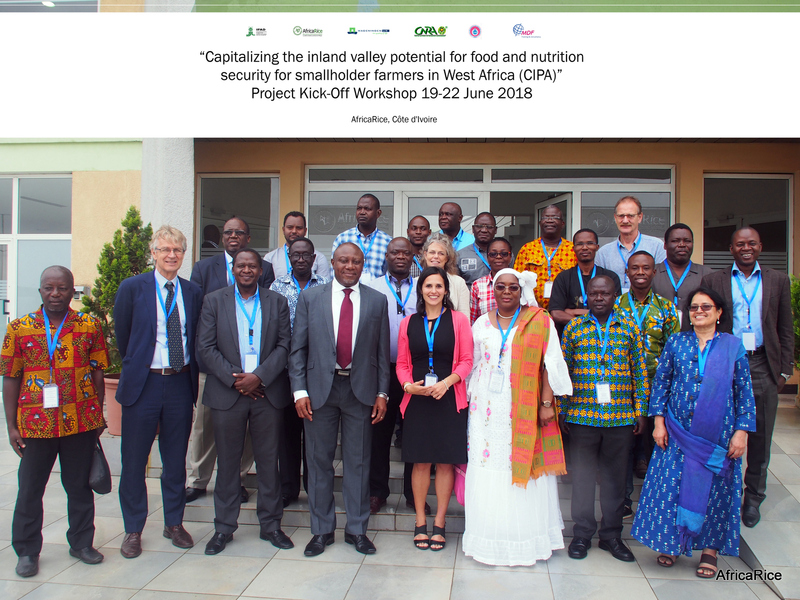 Key stakeholders gathered together at the Africa Rice Center (AfricaRice) headquarters, Abidjan, Côte d’Ivoire on 19 June 2018, to formally launch a landmark project aimed at boosting food, nutrition and income security of rural communities in Côte d’Ivoire and Ghana through productive and sustainable use of inland valleys for rice-based systems, while conserving land and water resources. The project titled “Capitalizing the inland valley potential for food and nutrition security for smallholder farmers in West Africa (CIPA)” is expected to benefit about 2,000 rural households, i.e., around 10,000 people. The beneficiaries (of whom at least 40% are women and 25% youth) consist of smallholder farmers, agro-pastoralists and other users of inland valley resources, traders, processors and rural entrepreneurs. The CIPA project will be executed by AfricaRice in partnership with the Wageningen University and Research, the National Agricultural Research Center of Côte d’Ivoire (CNRA), the Council for Scientific and Industrial Research-Soil Research Institute of Ghana (CSIR-SRI) and MDF West Africa. It will be supported with US$2 million from the International Fund for Agricultural Development (IFAD) over four years. In addition, AfricaRice and its partners will provide US$848,000 in-kind support over the project implementation period. Due to rapid population growth and climate change, inland valleys are increasingly being considered as the continent’s future food basket. Besides rice cultivation, these ecosystems provide opportunities for vegetable cropping and livestock production. They also supply local communities with hunting, fishing, forest and forage resources and serve as biodiversity and wildlife sanctuaries, and natural water buffers. “The overall goal of the CIPA project is therefore not only to contribute to enhanced food security and poverty alleviation, but also to biodiversity conservation and climate resilience for local communities, who are dependent on inland valleys,” explained Dr Josey Kamanda, AfricaRice Social Scientist and CIPA Project Coordinator. “CIPA will promote collective decision-making and priority setting to reach consensus on land-and water-use planning, marketing of inland valley products, through multi-stakeholder innovation platforms (IP), land-use modeling approaches and value chain analyses,” Dr Kamanda added. It will emphasize a systematic approach to selecting and improving inland valleys and production practices with the highest potential and lowest risk. A range of methodologies and tools developed by AfricaRice and its partners to characterize inland valleys and optimize their resource use will be tested in an integrated manner. The project outputs will include, among others, a comprehensive inland valley development support tool, a national inland valley atlas for each project country, policy briefs and stakeholder-learning videos, which will be actively promoted. CIPA will link directly with IFAD support investments in the two project countries, such as the Projet d’appui à la production agricole et à la commercialisation (PROPACOM) project in Côte d’Ivoire and the Ghana Agricultural Sector Investment Programme (GASIP), the Northern Rural Growth Programme (NGRP) and the Rural and Agricultural Finance Programme (RAFiP) in Ghana. The CIPA project launch workshop, which was attended by 35 national and international experts, included presentations and discussions on the context, objectives, proposed activities and implementation strategy of the project. 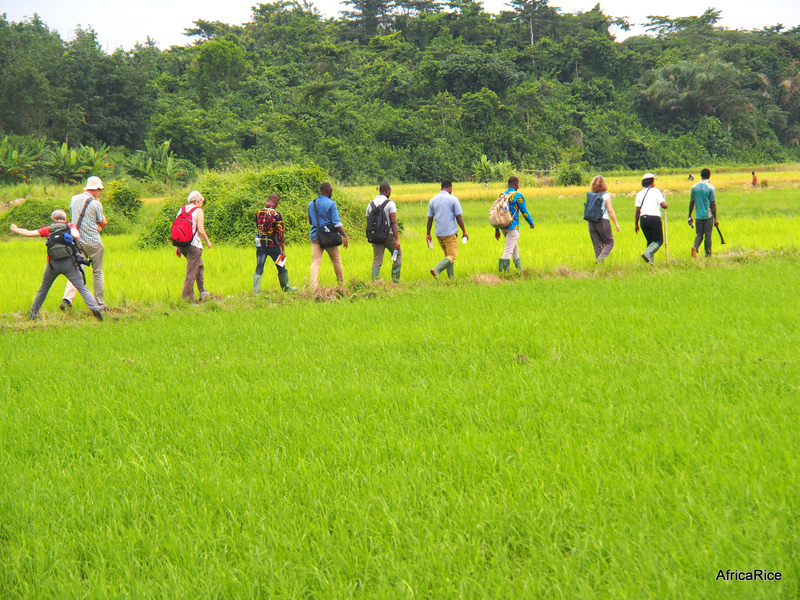 It was followed by a 3-day visit to selected inland valleys in Côte d’Ivoire.